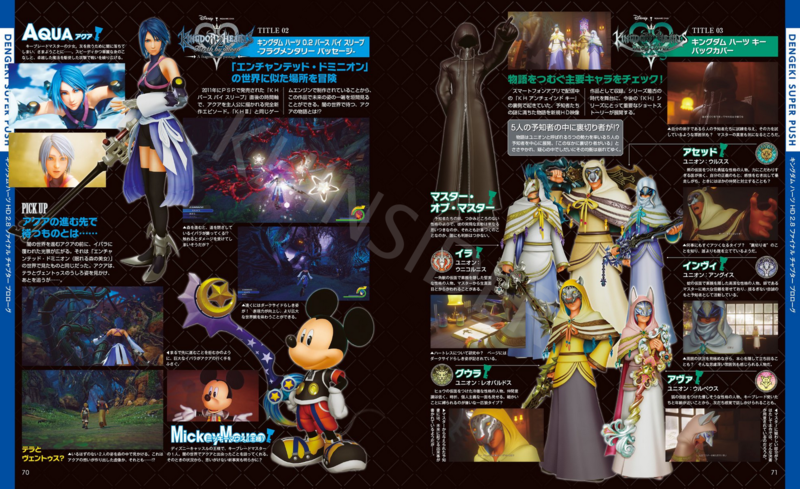 Dengeki Online's latest magazine has gone on sale, and in it is a four page spread on Kingdom Hearts HD 2.8 Final Chapter Prologue. 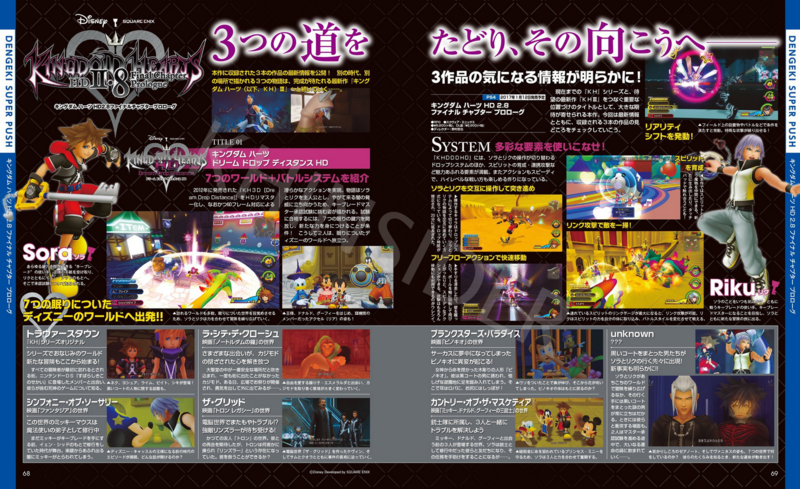 The renders for KINGDOM HEARTS 0.2 Birth by Sleep – A Fragmentary Passage – and KINGDOM HEARTS χ [chi] Back Cover were released yesterday and can be viewed here. >Shedding light on the details you want to know about the three titles! As it holds an important place connecting the KH series so far to the long-awaited new title KHIII, this title is drawing high expectations. Let's check out the main points of the three titles included, as well as the latest information. Sora: Wielder of a 'Keyblade' that can open any lock, he receives a letter from the King and sets off with Riku to see Yen Sid. There he learns of the Mark of Mastery Examination. Riku: A keyblade wielder who cares about Sora, and fights by his side. Sights set on becoming a Keyblade Master, he sets out on a new adventure with Sora. KH 3D [Dream Drop Distance], released in 2012, has been remastered in HD and now runs at 60fps, achieving glassy-smooth action. The plot features Sora and Riku as protagonists, and depicts them challenging the Keyblade Master Mark of Mastery Examination so that they may stand up to the encroaching darkness. In order to pass the exam, they must unlock the seven Sleeping Keyholes and acquire new powers! Thus, the two of them set off on a journey to slumbering Disney worlds. >Let's check out the major characters weaving the tale! The mystery-packed story of the Foretellers and the things happening behind the scenes in smartphone app KH Unchained Key is included as a cinematic work. Set in the earliest era of the series so far, a short story that is very important to the future of the KH series unfolds. >A traitor among the five Foretellers?! The plot unfolds with the five Foretellers, leaders of the five forces known as the Unions, at the center. With whispers that there is a traitor among them, the balance gradually collapses under suspicion and doubt. The teacher of the Foretellers. He seems to have an evasive personality, and nobody can tell whether all the off-the-wall things he says and does are simple whims, or calculations. Someone with a solid personality, who hides his face with a unicorn mask. He's teased by the Master for being serious. Someone with a cool personality, who wears a leopard mask. He doesn't have a strong sense of camaraderie, and occasionally shows an individualistic side. A lone-wolf type who hates being bound by particulars? Someone who seems to have a kind personality, who wears a fox mask. 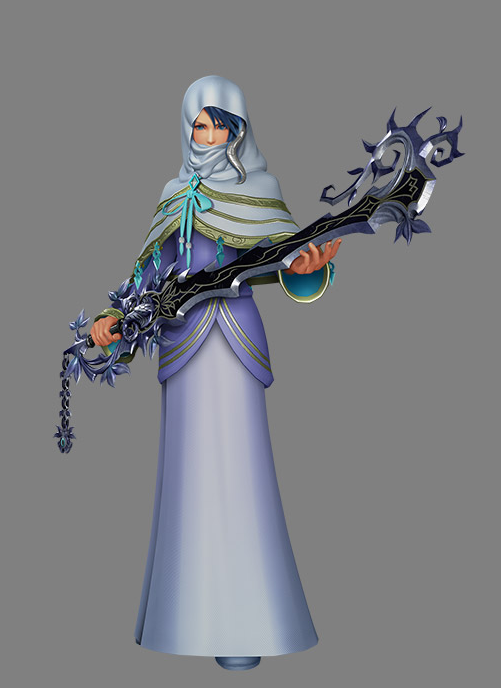 As she is close in age to the Keyblade Wielders, they often speak to her on a friendly level. Someone with a brave personality, who wears a bear mask. There's a strong side of him that cares too much about strength, and he tends to get carried away with baring his feelings and personal justice. Sometimes he even opposes his friends? Someone with a noble personality, who hides her face with a snake mask. She has the utmost faith in her teacher the Master, and bases her actions as a Foreteller upon her unshakeable loyalty. does it look it gula talking to skuld and to the player in that picture? The Fortetellers all look so gorgeous. I'm so hyped for Back Cover. 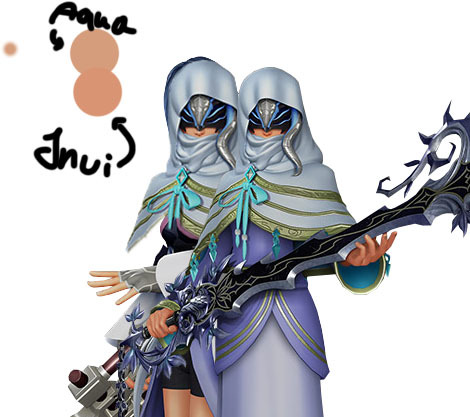 Anyway, is that Ava or Gula in the background of that one Invi picture? I can't tell. I think it's Ava? Invi, I'm getting some not so good feelings about you, girl. Go to your room. Does anyone know what Ava's saying, by the way? And you know... I sort of thought the theorists that thought Aced was asking Ava and Invi to join an alliance with him were wrong (I thought it was Gula he was referring to and not Invi), but now I'm not so sure. Invi's in the same place that Aced and Ava are when he was telling Ava that, so maybe it is Invi that he meant as the third person. You know, I'm really interested in seeing what Ava and Invi's relationship is going to be like. So far it seems pretty dynamic, and I hope that it stays that way. But at the end of Chi, Invi says how Ava raised a good kid. And you would almost think that if she was her enemy--or maybe at all mad at Ava for how she had treated her before--she wouldn't have said this, even if it was true. But she really seems to show respect for Ava in this instance. Man, I'm really excited for the Ava-Invi relationship. I don't know why -- maybe it's because Invi didn't have a major role in X. Would also be nice to finally see two original female KH characters other than NaminÃ© and Kairi/Xion/Larxene talk to each other, lol. @Goso; I mean, everyone looks down once or twice. It's just a sign of sadness - which is also why people say "heads up". I'm hype for Invi. Still barely know anything personal about her, yet I find her so fascinating. I don't think that line really holds any deep significance into Invi's relationship with Ava. Invi's line in KHx is union dependent. As in, she will say that whoever your union leader is raised a good kid, so it's not really a look into any particular relationship because it changes based on what union you are in. I figured since both of them look - more or less - frontal, I could do a comparison. They DO have a similar face structure. How dare you remove the mask! JK, it's a nice edit! It is going to be a dynamic relationship, I am calling it now! I also feel as if they had a close friendship. You have it almost correct, replace "stop" with "think". But Invi must have done something bad, or gotten blamed for something. As sad as I am to say this, The Player isn't considered a canon character. Because the lack of any set appearance and name, but if they do appear in the movie and become relevant (As relevant as Ephemer(a) and Skuld) I would infer that their canon union would be Vulpes. But the line Invi says varies on union, so if you where in Gula's Union. She would say "Gula raised a good kid". Goldpanner's translations in the OP! Would have had them up sooner except I got a bit busy with life. Soz guys!!! "[She sometimes takes stock of the situation while concealing her true feelings? She is someone with that sort of deeply thoughtful atmosphere.]" Does this prove my theory of why Invi is covering her mouth (concealing her feelings)? Do I get the award? Seems I was right about her loyalty, too! It means he thinks you are exactly right.